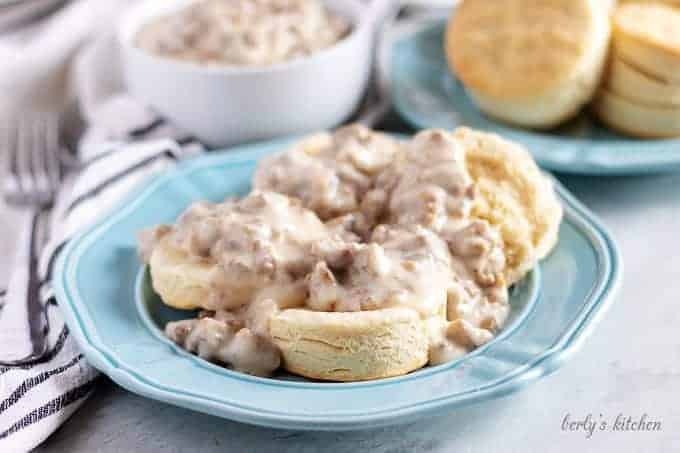 Looking for an easy sausage gravy recipe? Then look no further, because this gravy only uses five ingredients and comes together in less than 30 minutes! Breakfast is one of my favorite meals. When I was child, I clearly remember by father making a full breakfast spread on the weekends. We’re talking everything, bacon, eggs, toast, and hash browns. It was quite the feast for a family of four. As time went by, I tried to do the same thing for my family. There was something nice about getting up early on Saturday or Sunday to prepare a meal for those you love. While the family slept, I crept in to make coffee, eggs, french toast or pancakes, and bacon. By the time everyone was awake, the whole house was filled with the smells of Colombian coffee and apple wood smoked bacon. Similar to the aromas I woke up to as a child. I can tell you, after working 50 or more hours during the week for someone else, it felt pretty good to do this for my family. Especially, since I rarely saw them throughout the week. 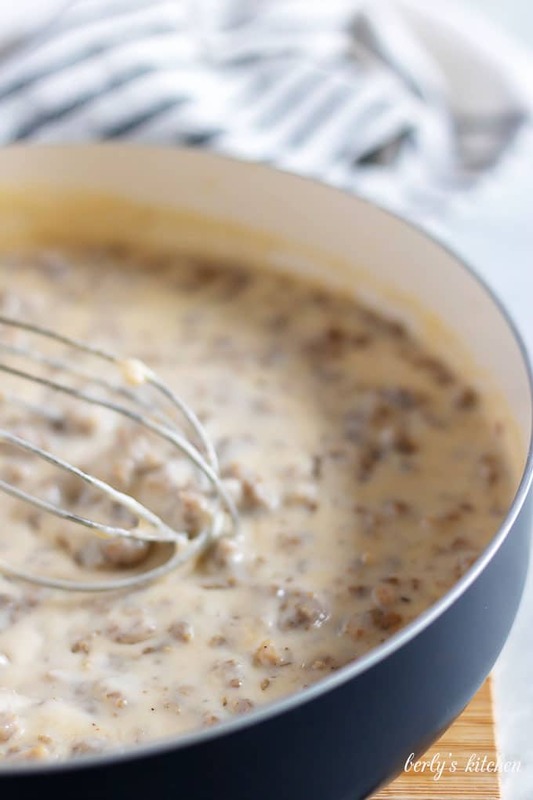 But, enough reminiscing, it’s time to talk about our sausage gravy recipe. While it might be homemade, making this dish only takes a few minutes and it’s the perfect topping for biscuits. Now, you can use store bought, our buttermilk biscuits, or your own personal recipe. Either way, try to have them ready once you finish this gravy. Trust me, when it’s done, you’ll be ready to eat. Shall we get started? First, gather the sausage, butter, milk, flour, and ground black pepper. 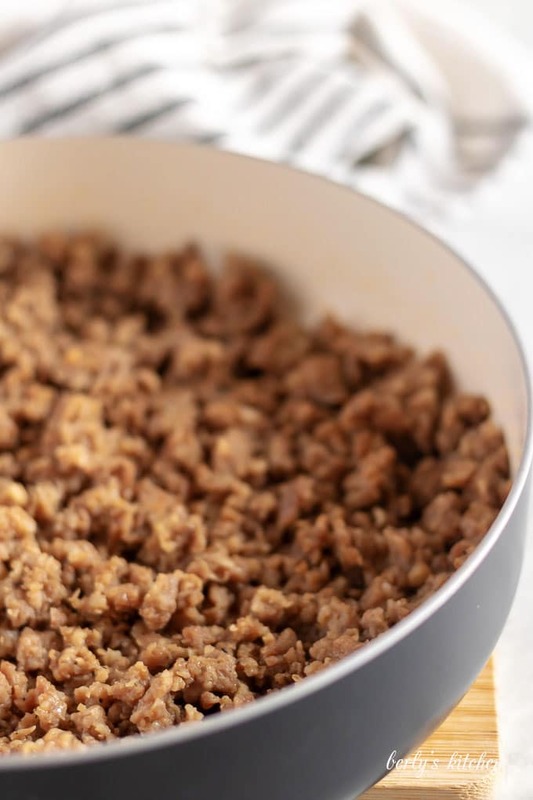 Break open the breakfast sausage and dump it into a large skillet or saucepan. Cook it over medium heat for 12-16 minutes or until the sausage has reach 160 degrees F. and there’s no pink color in the meat. 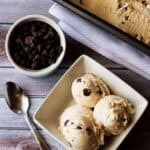 Be sure to break it up using a spatula or wooden spoon. On a side note, if you wanted to give this dish a Southwest flavor, you could use spicy breakfast sausage and our jalapeno cheddar biscuits. Just a suggestion. Next, evenly sprinkle the flour over the sausage using a spoon. Take your spatula and stir the sausage, letting it cook for another 4-5 minutes. You should start to see a crust forming on the sausage. At this point, go ahead and toss in the butter. Let it melt as you continue to stir the meat for another 30 seconds or so. Then, pour in the milk. As it heats, toss in the pepper and keep on stirring. 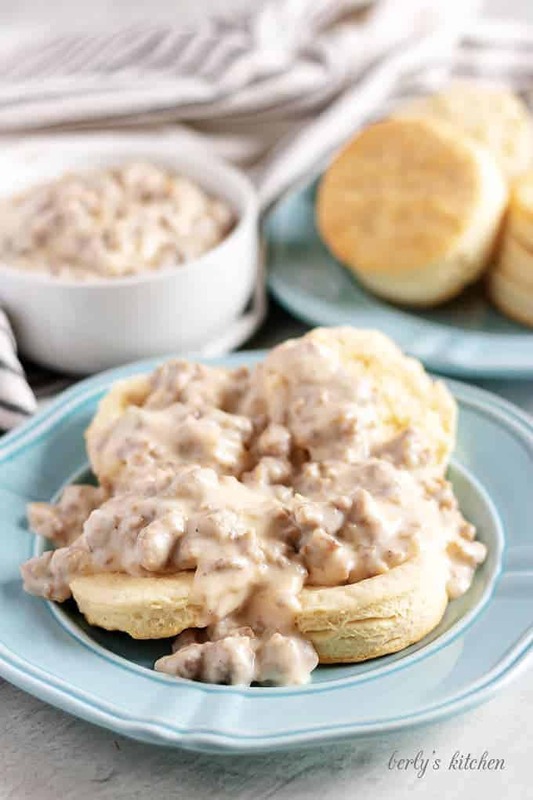 The sausage gravy should only need another 3-5 minutes of cook time. You might want to give it taste test and throw in some salt. In fact, I would advise you to taste it before adding any salt to the dish. Sausage is notoriously salty and the gravy may not need any extra seasonings. Once it has reached the thickness you like, remove it from the heat and serve it over your biscuits. That’s it, this sausage gravy recipe is done! Uh oh, for some reason you’re gravy is too thin. Well, grab a small bowl and put a tablespoon of cornstarch into it. Mix in two (2) tablespoons of water. Pour that slurry into the gravy and stir it over low heat until it thickens. Alternatively, you could just add a tablespoon of flour and let it cook and thicken. Don’t care for sausage, then use bacon instead. Cut the bacon strips into small squares and basically follow the same instructions for bacon gravy. The lesser known breakfast gravy that I grew up eating. Because, breakfast sausage was a rarity in our household. 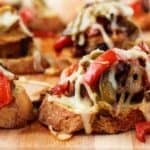 Looking for more delicious breakfast recipes? Then check out these fan favorites! 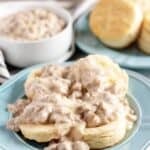 If you like our homemade sausage gravy recipe, please leave us a comment and rate the recipe card. You can also find us on Facebook, Pinterest, Twitter and Instagram searching for Berly’s Kitchen! In a medium skillet over low-medium heat, cook the sausage until there the sausage is cooked through and there is no pink left. Sprinkle the flour over the sausage and stir to evenly coat. Cook until the flour begins to take on a light to golden brown color, then add the butter. Stir the butter into the sausage until it is completely melted. Add the milk and mix well. If cooking on low heat (gas stove), turn the heat up slightly to help the gravy begin to thicken. Add the pepper and any salt if desired. Continue to stir until the desired thickness is reached. Then, serve hot over fresh biscuits. 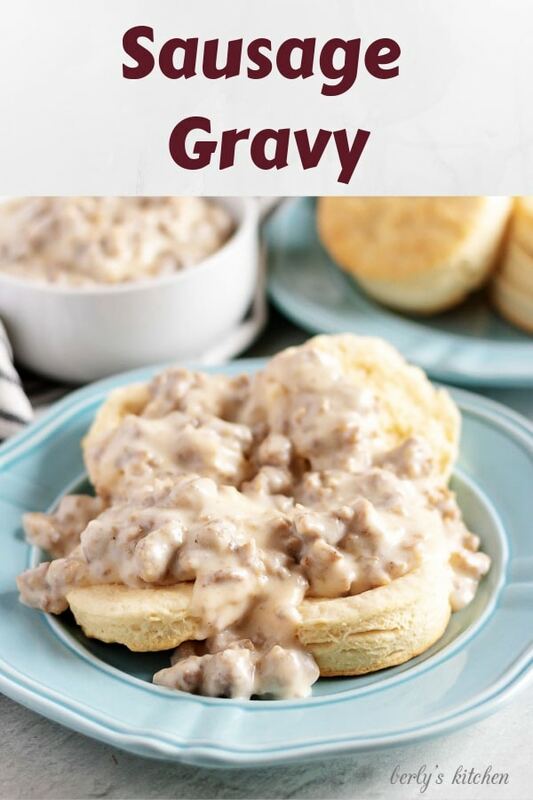 The calories listed are an approximation based on the ingredients and a serving size of 1/4 cup of sausage gravy. Actual calories will vary. The gravy can be stored in your fridge for up to three (3) days in a sealed container.